The ambitious scheme was unveiled along with a logo, a portal and brochures on 25 identified growth sectors before bigshots from the corporate world. Prime Minister Narendra Modi on Thursday launched his flagship 'Make in India' campaign to put the country prominently on the global manufacturing map and, in turn, facilitate the inflow of new technology and capital, while creating millions of jobs. The ambitious scheme, that also puts in place the logistics and systems to address, in a timely manner, queries of potential investors, was unveiled along with a logo, a portal and brochures on 25 identified growth sectors before bigshots from the corporate world from India and abroad at the Vigyan Bhavan conference complex in the national capital. The event was watched live in several cities in the country and overseas via video conferencing. Laying out the red carpet before investors, the prime minister said, "After what we have done and what I hear from you, I don't think I need to assure you any further on 'Make in India'." He hoped that industry across the globe would take his invite seriously. He said he was saddened in the past to see scores of citizens leaving the country to seek opportunities elsewhere. People have lost faith in domestic manufacturing and themselves. "We do not want any industrialist being forced to leave India," he said. "A trust was broken - that when a policy will be changed, when will the CBI (Central Bureau of Investigation) come. This is what I heard from all you. The biggest issue is trust. Why don't we trust each other? I want to change that." The prime minister said for him the term FDI for the domestic industry did not expand to "foreign direct investment" but "first develop India". "We have to create opportunities of employment. If the poor get jobs the purchasing power of families will increase." 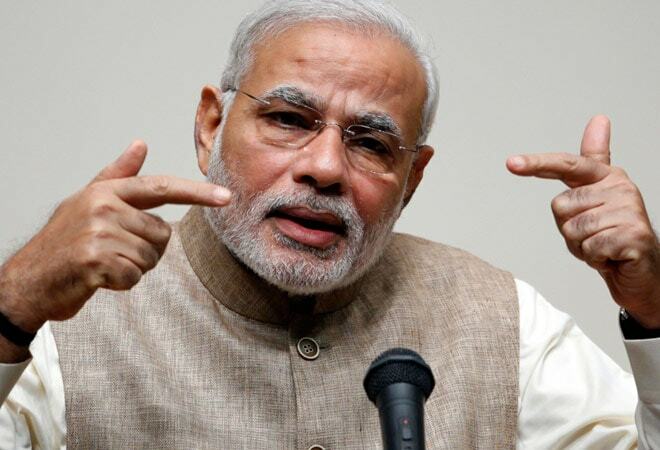 Pointing to campaign logo, he said, "This is the step of a Lion... Make in India." Ahead of the launch of the campaign, Commerce Minister Nirmala Sitharaman said a number of steps had already been taken by the Modi-led government to make it easier to do business in the country along with the removal or relaxation of foreign equity caps in several areas. "The processes of applying for licences has been made online, it is 24/7. The validity of such licences has also been extended to three years," Sitharaman said, adding several norms and procedures have also being changed to make it easier to do business in the country. At the event some top industrialists and executives, among the 500 who had gathered in the Vigyan Bhavan conference complex, were also invited to make short speeches. Kenichi Ayukawa, managing director of Maruti Suzuki India (MSI), said his Japanese group was among the first to invest in the domestic market and remains committed to the country. He said he was sure the country will eventually become one of the most competitive economies. "Today we commit ourselves to the 'Make in India' movement that was given to us by our beloved prime minister," Reliance Industries chairman Mukesh Ambani said. He said the main task before the industry in India was to achieve global competitiveness. The other speakers included Wipro's Azim Premji, Aditya Birla Group's Kumar Mangalam Birla, ICICI Bank's Chanda Kochhar, Lockheed Martin's Phil Shaw, and ITC's YC Deveshwar.